Guided tours of the museum provide visitors with an introduction to the building's history and special exhibitions on display. Group tours can be arranged in advance by contacting Sean McGee, director of museum operations, at 912.525.7179. The SCAD Museum of Art welcomes groups by appointment, extending its exhibition and educational resources through guided tours and access to scheduled film screenings, lectures and gallery talks. Group visits are available at reduced rates for a minimum of 10 people. Group reservations should be made by phone or email at least two weeks in advance. For further information or to make a reservation, contact us via email or by calling 912.525.7191. 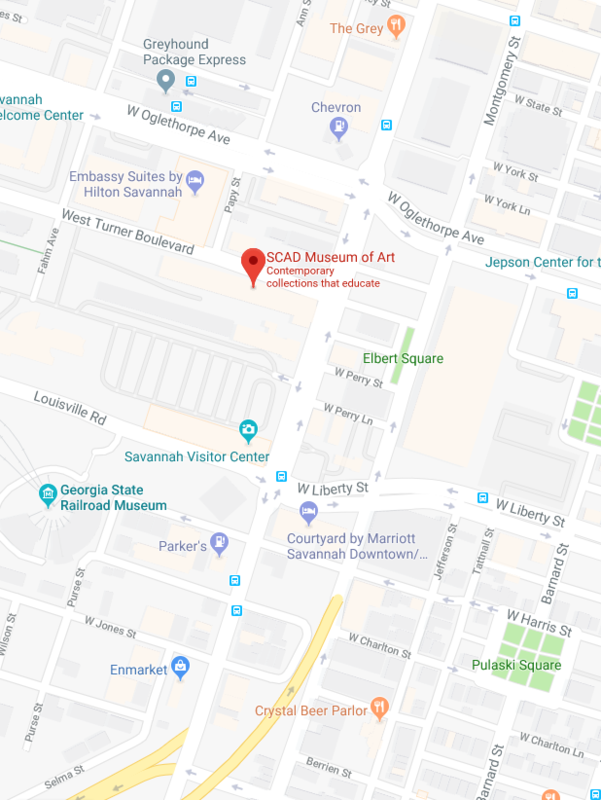 Parking for the SCAD Museum of Art may be found in metered spots alongside the museum on Turner Boulevard or in the Savannah Visitor Center parking lot located one block south of the museum on Martin Luther King Jr. Boulevard. All museum guests should enter the SCAD Museum of Art through its lantern tower entrance located on Turner Boulevard. In order to ensure all visitors to the SCAD Museum of Art have a positive and educational experience, we ask that each guest observe the following list of guidelines and policies. A tad of art, a tad of whimsy, a tad of everything. With gourmet coffee, inspired snacks, great gifts and art books related to our exhibitions, TAD is an engaging respite and an otherwise bespoke complement to the SCAD Museum of Art. The SCAD Museum of Art includes an intimate 250-seat theater outfitted with state-of-the-art digital projection and audiovisual equipment. Purpose-built to support the academic and creative programs at SCAD, the theater hosts a dynamic monthly schedule of film screenings, academic lectures and master classes with visiting artists and creative professionals. Situated within the SCAD Atlanta campus at 1600 Peachtree St., NW, SCAD FASH focuses on the future of fashion design, connecting conceptual to historical principles of dress — whether ceremonial, celebratory or casual — and welcomes visitors of all ages to engage with dynamic exhibitions, captivating films and educationally enriching events. SCAD offers several exploratory galleries that feature rotating exhibitions of internationally acclaimed artists, SCAD alumni and collaborative shows by current SCAD students, staff and faculty.